All new for 2019, it’s a surprise celebration honoring the originals, Mickey and Minnie Mouse, with new merchandise and beverage offerings including the Mickey Sipper and Birthday Hat Straw at various quick-serve restaurants throughout Walt Disney World Magic Kingdom. Don’t miss the Mickey Burger at Cosmic Rays. 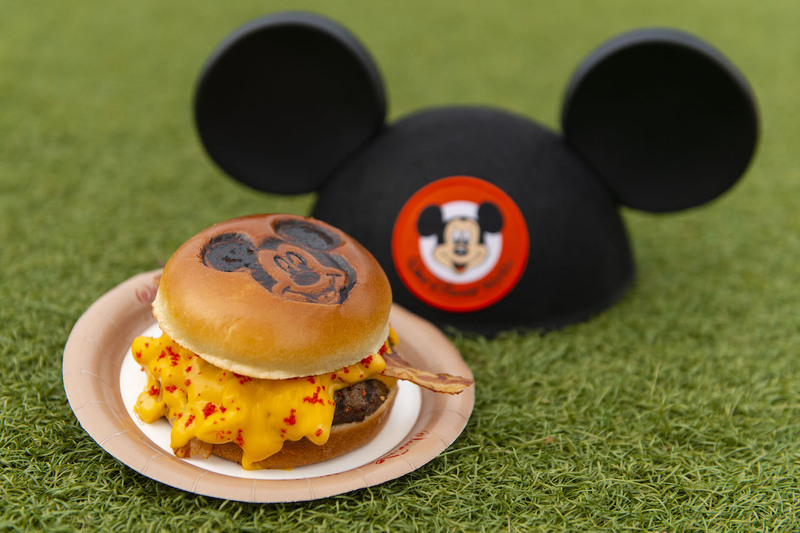 The burger comes with macaroni and cheese, American cheese, cheese sauce, flaming hot cheese dust, and bacon served on a Mickey Mouse bun. You’ll also find a wide variety of merchandise and special entertainment including Mickey and Minnie greeting guests together at Town Square Theater in their celebration outfits; and they keep the party going with an all-new street party, bringing all of their favorite Disney pals in the “Move It! Shake It! MousekeDance It! Street Party” right in front of Cinderella Castle. Mickey and Minnie will have their brand new celebration outfits covered in confetti and pompoms to lead the energetic, live-singing host on a fun-filled “mouse”-ical procession down Main Street USA to Cinderella Castle where everyone is invited to join in the festivities. The new original song, “It’s a Good Time”, along with some remixes of classic tunes will keep you moving. Be sure to look out for Donald, Daisy, Goofy, and Clarabelle will be there too, complete with dazzling floats. Mickey Mouse and Minnie Mouse encourage guests to “get your ears on” during the “Move It! Shake It! MousekeDance It! Street Party” at Magic Kingdom Park at Walt Disney World Resort in Lake Buena Vista, Fla.